Looking for the most secure way to protect your commercial property? You’ve come to the right place. Chain link fences are a common way to secure your property, be it residential, commercial, or industrial. Chain link fences, also known as wire mesh fences, are usually made from steel wire interwoven together to make a crisscross design. Chain link fences are often the first choice for commercial enterprises today—because they’re secure, easy to install, and not too costly. Plus, chain link fences are durable and can withstand strong wind. You probably remember this type of fence from your schoolyard as a child, but it’s also used in a number of other places. At Total Fence Inc., leading commercial fence company in Toronto, we can design and install the chain link fence that will fit your commercial and industrial needs. We’ll bring in our fencing professionals to evaluate your commercial property, take a look at the dimensions, and let you know what type of chain link fence you should consider. As a leading commercial fencing company in Toronto, we will use our expertise to let you know what fence materials and design will complement your property perfectly. Why choose a chain link fence over other types of fences for your commercial space? Well, chain link fences are very durable, secure, and versatile. They can easily be built and installed for a variety of heights and widths. For commercial places like playgrounds and parks, chain link fences are perfect to enclose an area, providing extra security and safety. 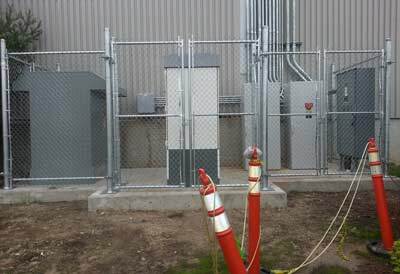 Industrial sites often use chain link fences as well, because they can be moved quickly; when you need to change locations, we’ll simply pull the steel posts out of the ground, roll up the fence, and move the wire fencing to your desired location across the GTA. In the event the chain link fence gets damaged, any leading commercial chain link fence company in Toronto will tell you that repairing them is not too difficult. We can easily cut out and replace the damaged fence portions, or re-coat and paint damaged areas. Commercial chain link fences are also easy to maintain; just grab a bucket of soap and water, and you can wipe off any dirt in no time. Contact us for a consultation and the Total Fence Inc. commercial fencing experts will be happy to help you decide if a chain link fence is the right way to secure your industrial & commercial property!